Being a huge fan of Wes Anderson, I was one of the first in line to watch The Grand Budapest Hotel when it was released last October. For about a hundred minutes, I was lost in the charming, nostalgic, complicated world of M. Gustave H., the fastidious concierge at the Grand Budapest Hotel in a spa town of the Republic of Zubrowka. M. Gustave’s world not only mirrors the troubled history of 20th Century Eastern Europe, it also subtly echoes the luminous settings of La Belle Epoque. The Republic of Zubrowka is an imaginary Eastern European country, coming from the brilliant mind of Wes Anderson - and his co-writer Hugo Guinness. Well, it wasn't completely out of thin air that the director conjured up Zubrowka and M. Gustave. Anderson said that the script was inspired by his friend Hugo and the Stefan Zweig novels he happened to stumble on a few years ago. Even though the country is not real, there’s a website for Zubrowka giving us viewers a glimpse of where the film is set and some of the props used in the film. There's also a website for the Zubrowka Film Commission, from which readers get an “exclusive behind-the-scenes look at filming in the Republic of Zubrowka, home of the illustrious Grand Budapest Hotel and the setting of three-time Academy Award nominee Wes Anderson’s latest film.” The site is similar to other state film commission sites as it tries to market its locations to filmmakers. Talk about a clever and creative marketing campaign. Screenshot of the website for the Zubrowka Film Commission: http://zubrowkafilmcommission.tumblr.com/. To bring the nostalgic world of M. Gustave to life, Anderson used various Eastern European towns and cities in Germany as the backdrops for Zubrowka. However, most of the key scenes in The Grand Budapest Hotel were specifically filmed in the easternmost area in Germany, namely Görlitz. Görlitz’s old world charm has made the town very popular with filmmakers. Within the last few years alone, a host of feature films were shot in Görlitz, including Inglourious Basterds, The Reader, The Book Thief, and The Monuments Men. Standing in for the Grand Budapest Hotel itself is an abandoned, Art Nouveau department store in Görlitz called Görlitzer Warenhaus. Anderson found the space while location scouting for the movie and promptly fell in love with its unique, historical architecture. The exquisite stairways, elevators, and atrium of the building also caught the attention of production designer Adam Stockhausen, who has worked with Anderson on his previous films The Darjeeling Limited and Moonrise Kingdom. He was also nominated for an Academy Award for 12 Years a Slave. "When I first saw the building, I thought: It's perfect. Just perfect," said Stockhausen. In addition to Anderson, who “just lit up” when he first saw the old department store, and Stockhausen, the film’s producer Jeremy Dawson was also impressed with Görlitzer Warenhaus. "We saw right away it would work — the building had the height and scale, the grandness, we needed. It had beautiful bones," shared Dawson. Görlitz Warenhaus Department Store during its heyday. Image via Google. "The columns, the staircases, that really magnificent window and that huge chandelier, that was already there, that's all original," said Stockhausen. "We built everything else." Given what he had, Anderson carefully planned out every shot and every frame of the movie. Stockhausen said the director usually required only "tiny pieces of rooms, just the minimum set required to support the camera shot." — Jeremy Dawson, Producer of "The Grand Budapest Hotel," on filming on location at the Görlitzer Warenhaus Department Store in Görlitz, Germany. Four months later, the Görlitzer Warenhaus Department Store became the filming location for the primary sets of The Grand Budapest Hotel, as well as the headquarter of the production. With Anderson’s detailed visions, the production design team transformed the building’s interiors into the various stages of the stunning Grand Budapest Hotel we see in the film. For the scenes in the lobby of the Grand Budapest Hotel, the work was double. Stockhausen and his team built two complete sets in the Grand Hotel lobby: one for the 1920s-30s timeline and another for a sequence taking place in the 1960s after the hotel is drastically changed to match the post-WWII culture. Screenshot of the lobby of the Grand Budapest Hotel during its decline in the 1960s - filmed in the Görlitz Warenhaus Department Store. Screenshot of the elderly Zero sitting in the lobby of the Grand Budapest Hotel in the 1960s. Note the distinctive symmetry in design, a Wes Anderson trademark. Screenshot of the young Author's first glimpse of the elderly Zero in the Grand Budapest Hotel lobby (in the 1960s). The film location of the above scenes was the Görlitz Warenhaus Department Store. A screenshot from the movie of a scene in the lobby of Grand Budapest Hotel during its pinnacle time in the 1930's - with Henckels in the foreground waiting for M. Gustave (who's followed by Zero). The film location of the above scene was also the Görlitz Warenhaus Department Store. Once settled on Görlitz as the main film location, it quickly became apparent how perfect the town was for the movie. “Görlitz has so much character in all its buildings that we realized we could pretty much make the entire movie there,” Dawson states. Annie Atkins, the graphic designer for The Grand Budapest Hotel, hard at work in one of the offices on the upper floor of the Görlitz Warenhaus Department Store. Image via The Indepent. By the way, you probably wonder what to become of Görlitzer Warenhaus now that production is over. Don't worry too much for the fate of this beautiful - and now very famous - building. All the publicity about The Grand Budapest Hotel filming in the historic building inspired a private investor to buy it. The space is now being renovated for a grand opening next year. Meanwhile, for more information on the set and film location of the Grand Budapest Hotel, check out this video. — Jeremy Dawson, Producer of "The Grand Budapest Hotel." For the establishing shots of the hotel, Wes Anderson used handmade miniature models of the Grand Budapest Hotel created at Studio Babelsberg, near Berlin. Screenshot from the movie of the miniature model of The Grand Budapest Hotel in the 1930's. Screenshot from the movie of the miniature model of The Grand Budapest Hotel in the 1960's. The Grand Budapest Hotel cast and production team stayed in Hotel Börse in Untermarkt, minutes away from the film set. For Anderson, this was another brownie point for the location. He even gave the hotel’s owner and employees a few parts in the film. Anderson credits the Library of Congress's Photochrome Prints Collection from the 1920s and '30s as a huge inspiration for The Grand Budapest Hotel. The production team designed the sets with ideas from these prints and from various historic landmarks across Eastern Europe. A photochrome print of the old Grandhotel Pupp in Carlsbad - image via the Library of Congress. Inspirations for set designs also came from spas and hotels in Germany and the Czech Republic, such as the Hotel Adlon in Berlin, the Grandhotel Pupp in Karlovy Vary, and the Savoy Hotel in London. “We looked through loads of books—anything we could find on hotel history or luxury travel,” shared Stockhausen. The Hotel Adlon in Berlin - image via Google. The pink hotel Anderson mentioned above is the Grandhotel Pupp. “There were some interesting interior details of the hotel that we liked, such as the wide corridors with carpet running down the center and windows that shone light into the hallways,” said Stockhausen. The Grandhotel Pupp in Karlovy Vary - image via Google. The Grand Budapest Hotel’s pink facade was also inspired by the Palace Bristol Hotel, in Karlovy Vary. The Palace Bristol Hotel, another inspiration for Wes Anderson's The Grand Budapest Hotel - image via Google. Remember the below beautiful scene from the movie of a stag on top of a dizzying peak? A miniature model of the setting of The Grand Budapest Hotel - image via Google. It was inspired by the real-life Jelení-skok (Deer Leap) Lookout, which is accessible via a funicular railway from the Grandhotel Pupp. Jeleni-Skok (Deer Leap) Lookout - the inspiration for the above miniature model used in The Grand Budapest Hotel. Image via Google. With the Gorlitzer Warenhaus Department Store as the center, other locations soon fell into place around it, including the film location for Check-Point 19. Screenshot from the movie of Zero standing outside Check Point 19. The interior scenes at Checkpoint 19 were shot at a former prison in Zwickaw, now known as Castle Osterstein. Castle Osterstein was the film location for Checkpoint 19 in The Grand Budapest Hotel. Image via Google. “It was used as a political prison [after World War II] that went out of use after [German] reunification,” said Stockhausen. “It’s officially decommissioned and is now awaiting museum status.” The site was destroyed by fire in 1403. In 1590, it was rebuilt to become the magnificent Renaissance castle we see today. No longer a prison, Castle Osterstein is now a nursing home. If you’ve seen The Grand Budapest Hotel, you no doubt are in love with the pretty pastries from Mendl’s, carefully crafted by the lovely Agatha. Production still of Agatha putting on the finishing touch on the beautiful pastries of Mendl's - image via Google. Production still of a scene at the lovely bakery shop Mendl's. Image via Google. The exterior of Mendl’s bakery is one of the storefronts on a picturesque street of old town Görlitz, near the Dreifaltigkeitskirche (Trinity Church). The interior scenes at Mendl’s confectionary shop, however, was filmed in Pfunds Molkerei, a famous 19th Century creamery in Dresden. The film location for Mendl's is the real-life famous bakery shop of Pfunds Molkerei, a 19th Century creamery in Dresden. Image via Google. 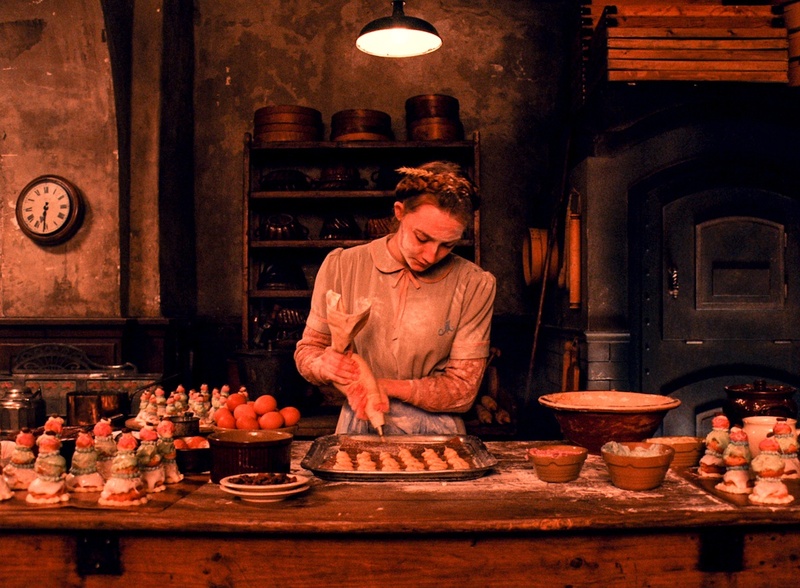 For the movie, the creamery becomes a bakery whose signature cream-filled pastry “Courtesan au Chocolat” plays an important role in helping M. Gustave. The delectable “Courtesan au Chocolat” were created by Müller Anemone from the bakery Café CaRe's in Gorlitz. These pastries are inspired by the stuffed Religieuse invented by Pantarelli, the Florentine chef at the French court in 1540 for Caterina de Medici. If you’d like to have a bite of the famous pastries personally, Wes Anderson created the below video showing us how to make the pretty “Courtesan au Chocolat." One very ominous scene in the movie was filmed at the Zwinger Museum in Dresden, Germany. In the movie, the museum becomes the Kunstmuseum, where Deputy Kovacs got off the cable car to escape from a stalker. Screenshot of a scene with Deputy Kovak walking toward the Kunstmuseum (filmed at the Zwinger Museum in Dresden, Germany). The Zwinger Museum is a former Rococo palace and orangerie that was transformed into an art museum for The Grand Budapest Hotel. Originally built in the 18th Century to host outdoor court festivities in Saxony, Zwinger was practically destroyed during World War II. After the war, it was rebuilt and is now home to important European paintings and porcelain collections. The Zwinger Museum in Dresden, Germany, where The Grand Budapest Hotel was filmed. Image via Google. While the setting is another miniature model made specifically for the movie, the design is based on a real life location, the Sphinx Observatory in Switzerland, an astronomical observatory above the Jungfraujoch in the Bernese Oberland region. The Sphinx Observatory in Switzerland was the inspiration for The Grand Budapest Hotel. Image via Google. Opened in 1937, the Sphinx Observatory is one of the buildings with the highest-altitude in Europe, standing tall at approximately 11,700 feet above sea-level. It’s where scientists study the stars and collect high-tech light scanning data, and one the highest observatories in the world. Alongside to the observatory, there’s a public viewing deck which offers magnificent views of the Jungfrau, Monch, and Eiger peaks. Remember the hotel’s ginormous restaurant where the elderly Zero tells the young Author (Jude Law) the story of his friendship with M. Gustave? The film location of the restaurant was actually the performance space inside the Stadthalle, the old city hall on Reichenberger Straße. Screenshot from the movie of the private dinner between Zero and the Author, filmed at the Stadthalle. Constructed in 1910, the Stadthalle had been closed for years when it was discovered by Anderson & Company. The production team then dramatically transformed the old city hall into the magnificent dining room we see on the big screen. To complete the set, Anderson commissioned artist Michael Lenz to paint a large backdrop in the style of 19th-century landscape artist Caspar David Friedrich. Screenshot from the movie featuring Zero and the Author during their private dinner at the hotel - filmed at the Stadhalle. The giant artwork on the stage behind them is by artist Michael Lenz, in the style of 19th Century landscape artist Caspar David Friedrich. The Stadthalle - image via Google. The same building was also the film location for a few other scenes in the movie: the ‘Trophy Room’ where Deputy Vilmos Kovacs (Jeff Goldblum) reads the controversial will to the surviving family members (see below screenshot). It was also the film location for the Kunstmuseum’s hall of armour through which Kovacs later tries to hide from his stalker. Screenshot from the movie featuring Deputy Kovacs rushing through the Hall of Armours in the Kunstmuseum, filmed at The Stadhalle. The exterior of Madame D.’s palatial home (see below screenshot from the movie) in real life is the 18th Century Castle Hainewalde on the bank of the River Mandau in Saxony. In 1933, the Nazi stormtroopers took over the castle and used it as a provisional concentration camp for political prisoners. When the war was over, the castle became a private residence. But since 1972, it has been an empty shell without inhabitants. In 2000, a private association rescued it and has since been working to preserve the castle because of its historical importance. Even though the exterior of Madame D.’s house was filmed at Castle Hainewalde, the interiors (see screenshots below) were mostly shot in Castle Waldenburg, built in the 12th Century (1165-1172) in Waldenburg, a town in the district of Zwickau in Saxony. Throughout the centuries, the castle has been destroyed and reconstructed numerous times. From 1948 to 1998, the castle was used as a medical facility but most of the original interior remains and is being restored. Castle Waldenburg was the film location for the interiors of Madame D.'s estate. Image via Google. There are guided tours of the castle. Since 2005, the castle has been renovated back to its former glory in 1912 and has been used as a special venue for tours, concerts, weddings and other festivities. The beautiful wedding scene in the movie was filmed at the viewing platform of the Basteibrücke Bridge in the Sächsische Schweiz region of Germany. The district is named after the landscape - the Saxon Switzerland - one of the most mountainous region of Saxony. Surrounded by the Ore Mountains (to the west) and the Lausitzer Bergland (Lusatian Mountains) to the east, and with the river Elbe flows through the Elbsandsteingebirge and separates the two mountain ranges, Sächsische Schweiz is breathtakingly beautiful, one of the most splendid landscapes in Europe. The viewing platform of Basteibrücke Bridge is now famous for being the location where Agatha and Zero got married. Image via Google. In 1826, a wooden bridge was built over a very narrow valley to provide easy access to the magnificent views of the sandstone rock formations as well as the Elbe River in the area. Today’s sandstone bridge dates approximately from 1851 and blends in beautifully with the natural rocks. Many other nearby rocks and peaks can be accessed via stairways and bridges. The Basteibrücke Bridge and viewing platform - image via Wikipedia. Anderson wasn't the only who fell in love with Görlitz. Markus Bensch, production executive of The Grand Budapest Hotel appreciated all that the historic town has to offer as well. "Görlitz is a very well preserved town," said Bensch. "It consists of roughly two thousands listed buildings, [but] we were of course limited in [terms of] what alterations could be made to the buildings. Same goes for the department store. Funnily enough, the department store found a new owner thanks to all the publicity surrounding The Grand Budapest Hotel. We were always glad to help that amazingly helpful city of Görlitz!" An aerial view of the beautiful, historical town of Görlitz, Germany. Image via Google. If you'd like to learn more about what filming in Görlitz is like, checking out this short behind-the-scene video hosted by Bill Murray. For information on filming in Germany, visit the German Film Commission. Before we sign off on this article, there's one last secret location behind the creation of Zubrowka that may surprise you. Even though most of The Grand Budapest Hotel was filmed in the Saxony region of Germany, Wes Anderson shared in an NPR interview that Prague is the true that inspired the creation of his Zubrowka. The beautiful city of Prague (the true inspiration for The Grand Budapest Hotel even though it wasn't filmed there) at sunset - image via Google. "Prague is the one that I feel sort of inspired me the most for this city, for the big city in our story," said Anderson. "Prague is such a spectacular place and one of those places that so much of the history is right in front of you." Prague, the city that inspired Wes Anderson's visions for The Republic of Zubrowka. Image via Google. And now, it's time to add all these magnificent locations to our bucket lists, shall we? We just received this amazing Google Guide Map featuring some of the film locations of The Grand Budapest Hotel from from Livia, one of our readers. We think this is super cool and want to share it here with you. Thank you so much Livia! By the way, folks, Livia has a gorgeous Easy shop filled with items created exclusively for fans of The Grand Budapest Hotel. Hop on over and discover them for yourself.